Why Does My Dog Bark at Strangers on Walks? Dog walking should be a fun, relaxing activity. Many people consider it one of the best parts of owning a dog. 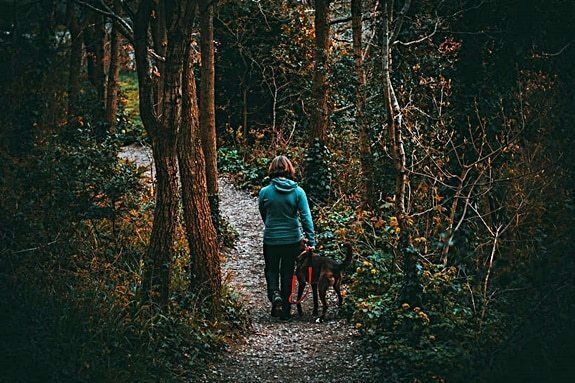 You get to enjoy the outdoors and the fresh air while providing your pooch with some much-needed exercise. Strangers you meet along the way, especially those with other dogs, should be a source of fun. There are many reasons why your dog might bark at strangers when you’re out walking. To stop the behavior, you first have to figure out why it’s happening. 3.4.1 What If Nothing Works? In this guide, we’ll take you through the four main reasons that dogs bark at strangers on walks. We’ll then show you how to tackle each issue. With the right approach, your pup will be behaving perfectly in no time at all. If your dog barks and growls at strangers, it could be territorial. Territorial barking is quite common in dogs. It’s often accompanied by aggressive body language. Your dog may be very stiff and hostile, and their hackles may be up. It’s in dogs’ nature to protect their land. After all, they are pack animals. Descended from wolves, dogs are used to defending their territory from strangers. In your dog’s mind, you’re the pack leader. Their barks serve as a warning to you that there may be a threat approaching. 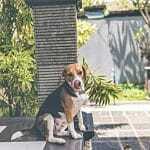 Usually, we see territorial barking in the home, and the area surrounding it. If your dog barks at the mailman, this is the reason why. Barking when someone knocks at the door or walks past the living room window, is also territorial. If they spend a lot of time in the car, some dogs even see this as their territory. If you’ve ever walked past a dog in a car and they’ve barked at you, this is why. Territorial barking on walks can become a problem if you walk your dog in the same area. The more time your dog spends with you in a particular location, the more it feels like his territory. He’ll start to associate the area with you, and feel that it’s his responsibility to defend it. If you’ve had your dog for quite a while, and they’ve only recently started barking at strangers on walks, it’s likely territorial. They’ve just started to feel that their walking route belongs to them. Barking due to over-excitement is entirely different from territorial barking. Rather than appearing aggressive, an excited dog will seem, well, excited. They may spin in circles, whine, wag their tail or jump up and down when they see strangers. You’ll notice that an over-excited dog seems to have a lot of energy. They may pull on the leash to try to approach the stranger. The good thing about this kind of barking is that your dog likes people. When your dog sees a stranger on their walk, they are delighted at the idea of a friend to play with. Unfortunately, this excitement and happiness often express itself as barking. Strangers may be taken aback, and some people (especially children) may feel threatened. This kind of over-excitement is usually dependent on the animal. Most of the time, you haven’t done anything wrong to cause it. Your dog is simply excitable and energetic by nature. Some breeds are more prone to this than others, such as beagles and terriers. However, all dogs can be excitable – after all, being social is in their nature. Occasionally, dogs may bark as a means of greeting. You may see this same sort of barking at home when family members return after work. Sometimes, though, over-excitement comes from associating strangers with rewards. 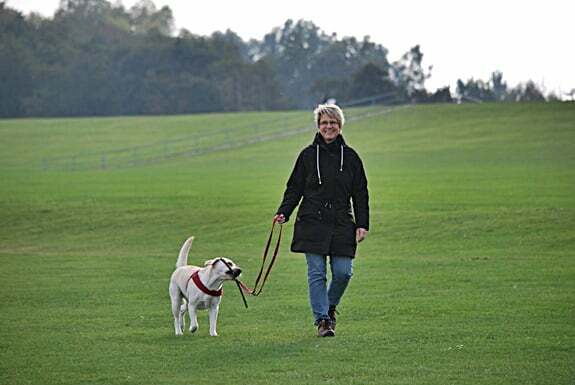 If people on your usual dog-walking route tend to offer your dog treats, this could be why. Your dog is expecting a treat whenever he sees someone, and therefore getting excited. Or, it could be that your dog loves people! Dogs who haven’t been properly socialized may also bark at strangers on walks. Usually, this stems from the dog’s puppyhood. Puppies, when they’re very young, need a lot of socialization with humans. This gets them used to people and allows them to realize that humans aren’t a threat. If your dog wasn’t able to see many people as a puppy, it can have undesirable results. This is often the case with dogs from puppy mills, or farm dogs. Even if your dog was socialized as a puppy, it’s possible for them to forget this training. If your dog doesn’t see humans (other than you) often, he may forget how to act around them. This might be because you live alone and aren’t often visited by family or friends. It could also be because you live in a remote area, and don’t often meet people on walks. If you have a rescue dog from a shelter, they may also be suffering from a lack of socialization. Dogs who have been in a shelter for a long time can become unused to people. They also may have had a traumatic past, leading them to become mistrustful of humans. A poorly socialized dog will appear scared when a stranger approaches. Barking may be accompanied by cowering, trembling, whining or pulling away. Your dog’s body language will also reveal anxiety. His tail may be between his legs, and his ears may be flattened. He may also show aggression when the stranger gets too close. This is because aggression will cause the stranger to back away, making your dog feel safer. If your dog suffers from compulsive barking, they don’t bark for a specific reason. Yes, your dog will bark when he sees a stranger on his walk. But he’ll also bark when he encounters another animal, a tree, a shadow or a strange noise. He may bark when something exciting happens, or when he’s bored. A compulsive barker will at almost anything, in almost any situation. If you’ve ever noticed your dog barking at apparently nothing, it may be a compulsion. Have you ever heard a dog barking, perhaps in your neighborhood, and it seems like they never stop? Day and night, the dog will bark. It’s often extremely repetitive; the same sound, over and over again, at the same interval. It’s likely that compulsive barking is the cause. If your dog is a compulsive barker, they may also demonstrate other repetitive behaviors. These may include pacing, circling, or chewing parts of their own body. If your dog barks at strangers, you may notice that the barking doesn’t stop when the strangers are out of sight. Dogs may bark compulsively because of anxiety, trauma, or a personality disorder. There may be many reasons: a stressful past ordeal, a lack of stimulation, or genetics. Often, though, there is no clear cause. If you suspect your dog suffers from compulsive barking, you should take them to a certified animal behaviorist. Sometimes, it takes a professional to successfully rid a dog from compulsive behavior. So, you’re now familiar with the four main reasons why dogs bark at strangers on walks. You should now have an idea of which category your dog best fits into, according to their behavior and history. Take your time when trying to diagnose their problem so that you’re sure. When you’ve determined why your dog barks at strangers, you should use one of the following training techniques. They’re tailored to each particular problem. If you aren’t sure, try the first one initially, and see what happens. If it doesn’t work, move on to the next, or try combining the methods. But remember, persistence is key. So, you think your dog is exhibiting territorial barking. The best way to curb this behavior is by distracting your dog. When you’re out on a walk, and you see a stranger approaching, get your dog’s attention before they notice. Throw a ball for your dog to fetch, if they’re off-leash or on a long leash. Allow them to play with their favorite toy. Keep some exciting treats in your pocket, such as pieces of chicken or cheese, or whatever your dog prefers. Offer your dog small pieces of food when you see the stranger, and allow them to keep nibbling at the stranger gets closer. Initially, you’ll avoid the problem because your dog will be distracted, and won’t notice the stranger. However, after repeating this several times, your dog will learn that approaching strangers are no threat. If you’re not anxious or worried, your dog will learn that there’s no need for him to be. Your dog will know that when a stranger approaches, he can safely eat treats and play, and nothing bad will happen. If this doesn’t work, you can try the “Quiet Training” method. When your dog starts to bark, clearly and calmly say “quiet.” Then, distract your dog by showing them a treat or toy. When they stop barking – and not before – repeat “quiet” again, and reward them. Soon, they’ll learn the meaning of the word. Then it’s just a case of commanding them to be quiet when they start to bark. If your dog is barking at strangers because he’s over-excited, it’s best to take a slightly different approach. Your excitable dog is barking because he associates a stranger with a reward. This reward could be food, play or physical affection. When training your dog out of excitable behavior, your goal is to make them realize that if they bark, they don’t get this reward. When you’re walking with your dog, and they see a stranger, keep walking as normal. Once they start to bark, turn around and walk your dog in a different direction. Don’t panic, run, yank the leash, or verbalize. 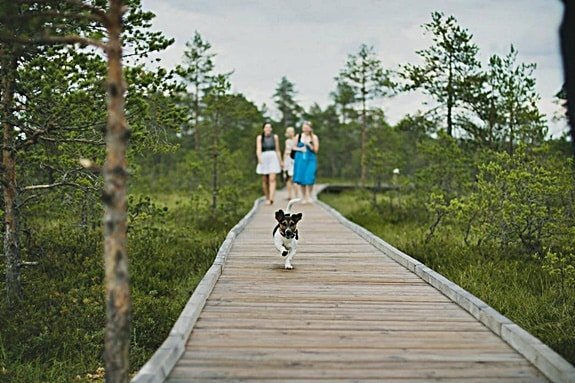 Calmly turn your dog around and continue walking elsewhere. Eventually, your dog will learn that if they start to bark, they don’t get to meet the exciting stranger. Sooner or later, your dog will be more hesitant to bark when a stranger approaches. When your dog reacts in a calm way to a stranger, offer them a reward. If you’d like, you can combine this with the “quiet” command detailed above. After many repetitions, your dog will learn that keeping quiet and calm will get them the reward, rather than barking. Socializing a dog that isn’t used to humans is a long, arduous process. However, it can be done without the help of a specialist, as long as you’re persistent. The following is only advisable as long as your dog isn’t dangerous to people. If he’s bitten strangers, for example, it’s best to get the help of a professional dog trainer. The key to socializing a dog is exposure. The more people they meet, the less frightened they’ll be of strangers. Invite as many different people to your house as you can, at different times. Ask the visitor to be friendly and affectionate to your dog, and to bring treats. It’s important that your visitors don’t back away when your dog barks, as this will only encourage the behavior. Instead, they should stand their ground. When the dog stops barking and seems calmer, you should offer the dog a treat. Eventually, your dog will begin to realize that calm behavior gets rewards. He’ll also associate new people with positive things, such as food and affection. 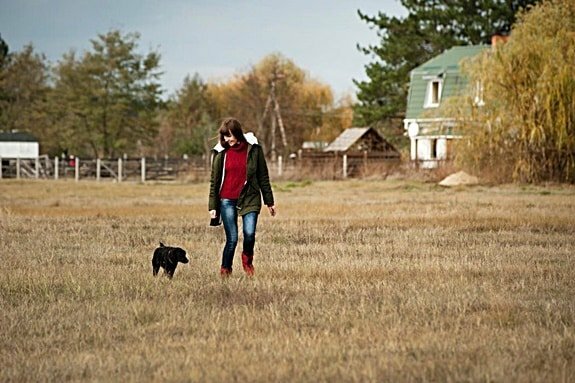 Walk your dog as often as you can, in as many different places as you can. Stay calm and happy, and don’t pull your dog away from strangers. If they can see that you’re calm, they’ll realize there’s no need to worry. If your dog has a successful interaction with a stranger, such as ignoring them or staying calm, reward the behavior. By now, you know the best methods to train your dog out of barking. However, it’s equally important to know what not to do. There are certain things you can do that will only make the situation worse. You could, in fact, already be exhibiting these behaviors without realizing. So, it’s important to make sure that you don’t do any of the following. If your dog barks at strangers in public, it can be tempting to offer them treats to get them to be quiet. However, you must go about this the correct way. As we’ve outlined above, only provide treats and affection once your dog has stopped barking and is already calm. If you offer your dog a treat while he’s barking, he won’t have any incentive to stop the behavior. In fact, you’re teaching him that barking is a good thing because he gets a reward. Even offering your dog physical affection, such as petting, is a mistake when he’s barking. Any positive attention at all will let your dog know that barking is acceptable. Instead, when your dog barks, ignore him. Don’t make eye contact, touch him or talk to him. Only reward him with attention when the undesirable behavior stops. When your dog is unsociable towards strangers, it’s easy to want to hide them away. Many people make the mistake of stopping the walks altogether. Or, only walking their dog in remote places where they won’t meet any other people. Unfortunately, this is only prolonging the problem. The longer your dog goes without seeing any other people, the worse the behavior will be when he eventually does. Dogs are social creatures, and keeping them locked up away from people isn’t good for them in the long run. Although it may solve the problem in the short term, your dog will eventually have to meet a stranger. And when they do, you’ll have a more severe problem than before. If you stop taking him for walks, he’ll also not get the exercise and energy release that he needs. This could lead to other behavioral problems such as destruction of the house. We know it’s not a very nice feeling to be walking your dog while they bark at strangers. However, dogs are incredibly perceptive of human emotions. If you’re anxious, panicky, or stressed when your dog meets a stranger, they’ll pick up on it. As you’re their pack leader, your emotions influence your dog’s emotions. Imagine you’re walking along, and you meet a stranger. Because you’re anticipating that your dog will bark, you get very tense. You stiffen up and tighten the lead. Instantly, your dog has received a message. You’ve reacted negatively, so something must be wrong. This stranger approaching is a big deal. They must be someone scary, or threatening, or exciting. What’s your dog going to do? Bark, of course. Instead, stay calm, and act as though everything is normal. Your dog will pick up on your emotion and be less likely to react. Dogs respond far better to positive reinforcement (reward) than punishment. If you punish your dog when they bark at strangers, you may make the situation worse. If you yell, yank painfully at the leash, or hit him, your dog will panic. He probably won’t understand that you’re punishing him for barking. Instead, he’ll come to associate the presence of strangers with bad things happening. Think of it from the point of view of your dog. Whenever he sees a stranger, bad things happen (you shout, or inflict pain upon him). Not only that, but your dog won’t understand what you’re saying when you yell. He’ll be so stressed out already that the yelling will only sound like loud noise. In short, punishment is only going to make your dog more scared of or aggressive toward strangers. He’ll be anxious whenever he sees a stranger because he knows you’re likely to react negatively. Your dog may become afraid to go outdoors because they associate the experience negatively. It’s far more effective to stay calm and reward your dog when he displays calm behavior. The above is a useful guide to curing antisocial barking behavior in most dogs. If you follow our advice, you’ll have a well-behaved dog before long. The key is to understand which kind of problem your dog has, and treating it appropriately. 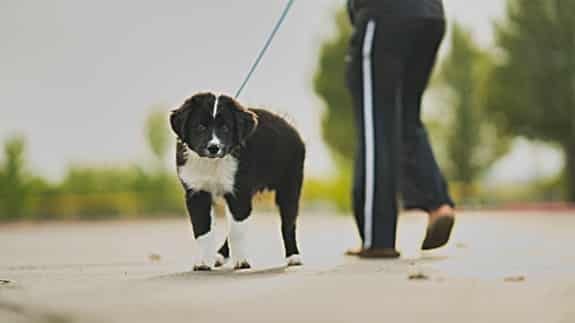 Monitor your dog’s behavior closely when you’re out on walks. If they seem aggressive and hostile towards strangers, it’s probably territorial. If they seem excited and happy when they bark, follow the guidelines for over-excitement. If they seem scared and defensive, they need more socialization. Be sure not to treat a problem that you don’t have. For example, if your dog is over-excitable and you reward them with treats whenever they see a stranger, this may make the problem worse. Importantly, don’t expect changes in a day or two. Dogs learn through persistence and repetition. Depending on your dog, you may need to repeat the training for weeks before they start to make good progress. This may vary according to your dog’s breed, their past, and how severe the problem is. In rare circumstances, you may find that your dog isn’t responding to anything you try. Don’t worry – it doesn’t necessarily mean you’re doing anything wrong. It could be that your dog has a more deep-seated behavioral problem that’s harder to change. If this is the case with your pooch, make an appointment with a certified animal behaviorist. They’re qualified professionals, many of them with years of experience training dogs. It may take them some time, but most issues with strangers can be ironed out by a behaviorist. Finally, if you’re not sure how to find a behaviorist, talk to your veterinarian. They may be able to give you some advice themselves on techniques you could try. They may also be able to recommend a behaviorist that they can vouch for. 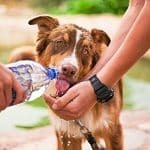 Why Does My Dog Pee So Much on Walks? Why Won't My Dog Make Eye Contact with Me? Why is My Dog Afraid of the Vacuum Cleaner and Brooms? Why is My Dog So Thirsty All of a Sudden?